It did not take long to realize this was not going to be a typical race. Even for St. Louis. When Maureen and I arrived, the registration tables were not ready 45 minutes before the scheduled 11:30 A.M start. By 11:40 there was still no indication this event would be underway. And I seemed to be the only “community member” not part of the Washington University Running Club, an ultra-fit bunch who all ran to start of this race and was clearly not deterred that the couple of miles from campus would make for a too long warmup. Then there was the matter of the race route. It was not marked or coned off, but being a mere counter-clockwise rectangle was unlikely to result in the directional discombobulation I am prone to fall victim to. Getting run over, however, was another matter. “The city had some meter concerns,” one of the organizers announced, explaining why St. Louis did not close off a few roads or even grant a permit for that matter. “So I suggest you run on the sidewalk on Delmar.” Delmar Boulevard, by the way, is a well trafficked road of which folks are often advised not to go north of due to safety concerns. Eventually, the 40 or 50 us shuffled our legs to a makeshift starting area and commenced running after a little discussion as to how to start the race. (“Should I just say ‘three, two, one’?” an organizer asked. “How about ‘ready, set, go! '” another suggested.) But not even 100 meters into the race, we already had to stop for about 10 seconds because there was a red light and cars blowing through the said Delmar Blvd. crossing. By that point I had already given up on running this race for time. Now I just wanted to see how well I could keep up with these college kids who were literally half my age through the streets of St. Louis. After crossing Delmar, a gangly group of six guys set the early pace, with one of them observing we were running 5:40/mile. Despite knowing that would be suicide for me, I stayed with them—at least until the road turned upwards, when the front six got several steps on me. Running hills is not my forte. We rounded a corner, and then another, until we were already running back on Delmar. Here three other guys got around me, so I was now in 10th place. My legs felt fine but my stomach muscles were pumping too hard from heavy breathing, so my pace kept creeping up. The sidewalk also got sketchier, with a few segments of it akin to boulder hopping. I could still see a lot of the leaders ahead though, especially as they crossed Delmar to the staging area. I was not sure how far we had run already since I sold my original Microsoft Band a few weeks ago (in anticipation of purchasing the new Microsoft Band 2 soon), but no smart band was necessary to know we had not run five kilometers. This course was going to be well short. I thus had something in reserve to put in a good final sprint. “Come on!” I egged on one of the runners as I caught and passed him 50 meters to the finish area. That was enough to get him into an all-out sprint himself, and we finished about together. When we stopped running, I gave him a high-five. Was he ninth place or was I? Who knows, as there was no finish line. It was then that I stopped the Endomondo app on my phone. A couple club members were already joking about how we “broke the world record” for the 5k. In fact, Endomondo said we had run… 1.5 miles. So the course was indeed short, but by only 1.6 miles. Small detail. The race organizers then conceded that the course was not quite 5K “except for the walkers,” presumably because walking the same route in more time meant the route must have been longer for them. Nevertheless, a winner was crowned, and he was asked as to how the race could be better next year in its second running. “Maybe be a little longer,” he replied. We also were rewarded with nice hot dogs, and as the chef pointed out, “and you didn’t even have to run three miles to get one!” I ate two. 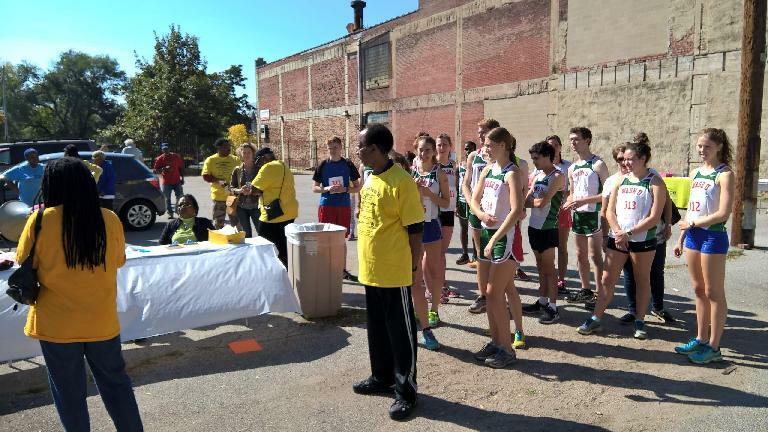 Lastly, this not quite so professionally organized race benefited Lewis Place Historical Preservation, including raising funds for after-school programs. “Because learning science is important,” someone said. Especially learning what a kilometer actually is, it seems.